The Boring Headshot Argument – Traditional, Quality, Outdoor Headshots Still Work! Let me set the record straight. I do a lot of headshots (several hundred to 1,000+ in 2015) and I do plenty of creative headshots, but contrary to what others might think, not everyone wants, needs nor cares about a more creative, artsy type headshot. The traditional style, classic headshot that I started doing in the 1980's which was around long before then has stood the test of time. If you are a photographer, don't get caught up in the argument of what is boring and what is creative. It's more important that 1) That there is a demand for your style. 2) That you don't overlook the classic, traditional style headshot. 3) You stay busy doing what you love. At the end of the day, if you are not busy doing headshots, you need to re-evaluate why. 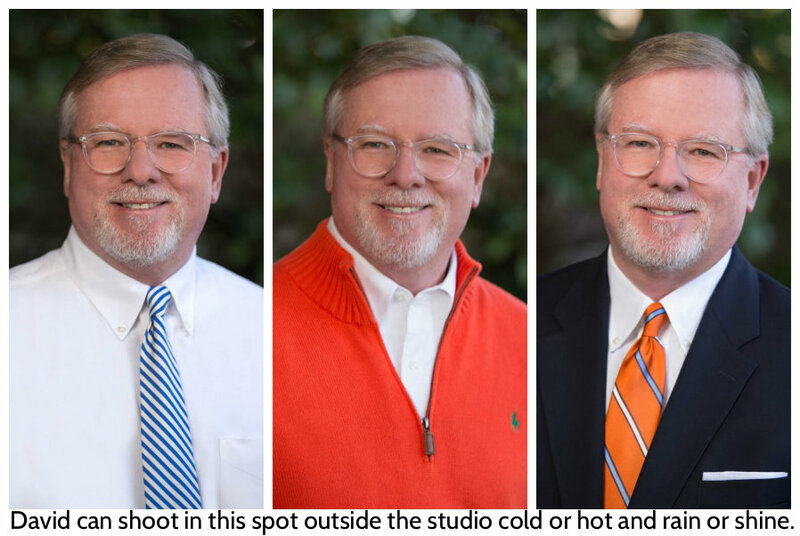 The sample headshots at the top of this post were taken outside our North Raleigh studio. They are classic, traditional style headshots that can be taken in hot or cold weather and when it's raining or shining outside based on the location that I shot them in. If you consider them boring, that's completely up to you, but here is what you don't know. The businessman drove 75 miles one way to have me take his headshots. He was very happy and said that his business partner would be contacting us as well. At the end of the day, that is more important to me than any opinion about whether the headshots above are boring or not. Whether a headshot is consider traditional or more artsy creative, at the end of the day, it's hard for quality to be boring. If an image is well lit, well photographed and well retouched, the quality of the final image will far outweigh a poorly shot image. It's also hard to make a client happy with poor quality. Don't get caught up on what others define as boring or what someone else defines as creative. Focus on quality and make sure there is a market for your style.